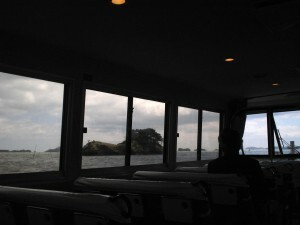 Matsushima,　near Sendai welcomes you. 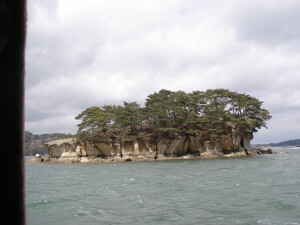 The 260 pine-clad islands around Matsushima Bay were created by gradual erosion. Since Matsuo Basho visited and praised its beauty in his Haiku, the picturesque view of Matsushima has attracted tourists more than 300 years. Unfortunately places like Matsushima are bit touristy but OK with me unless they throw their hospitality minds away . I am supposed to write about Nikko and it’s area, aren’t I? Today, I am not talking about Nikko but Sendai. Sendai is located in Tohoku region and the biggist city among Tohoku 6 prefectures. It takes about only one hour and six minutes from Utsunomiya where I live to Sendai by Shinkansen (Bullet train). About 240km north from Utsunomiya. Acturally it takes about 50 minutes from Tokyo to Utsunomiya in spite of the 100km distance. Can anyone tell why that happens? The answer is; it is densed area between Tokyo and Utsunomiya so that the bullet trains are not allowed to run as they supposed to. Even so, bullet train is far better than normal train. It takes 1 hour and 40 minutes if you use normal train. I will tell you why Sendai next time. Unfortunately I cannot tell you about Tochigi this time. Every year my father in law staying with us on New year’s eve and New Year’s day. He is a paraplegic so that my wife and myself are quite busy when he is at home. I will tell you about the relationship between husband and wife, in-laws etc. near future. Anyway, my wife and I have been to my mother’s place to do New Year’s greetings. We stayed Hiratsuka a couple days and whole my family decided to go to Daiyuzan Saijoji temple (founded more than 600 years ago) to pray for a long life and happiness for the year. It took us nearly a couple hours by car due to the traffic jam which we have expected. The day we visited was the first day we are allowed to come up the parking lot nearby. We have to park the car out skirt of the city and we have to use the shuttle bus on January 1st, 2nd and 3rd . We prayed there and we bought Omikuji (fortune written on slips of paper)which people normally do at shrines and temples. 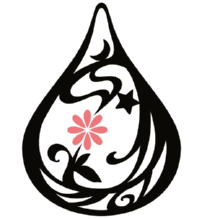 I almost forgot to tell you about “osaisen”. Before we pray in front of the statue, we can find the box which is expected a lot of money dropped by the visitors those who are wishing for a good luck. You must prepare coins before you pray in Japan. Those donations are very helpful and only the season temples and shrines received, I suppose. Sorry for no photos this time. How lucky I am!! 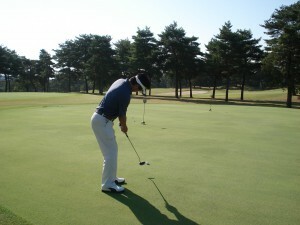 We have more than 130 golf courses in Tochigi prefecture. Even in Utsunomiya city where I live, has got 8 golf courses. We can play from 5,000yen to 19,000yen depends on weekdays or weekends. I played with my cousin at Seven hundred club. The course has been picked up by my cousin thru internet. He chose the chepest day which is their closing day. Even a closing day, they open for the public who is eager to play golf. Restaurant and Bath room are the facilities we cannot use. Normal golf in Japan, people enjoy bathing after golf game. I do not need that facility when I play, cause I’ve been plyaing golf in New Zealand for about 22 years. General Japanese cannot accept the situation even in inexpensive fee, I suppose. I think I paid only 4,500yen for the game. About 25 years ago, I occasionally played golf and I remember I paid more than 30,000 yen on weekends. It took me about one hour from my house to Furumine-jinja. 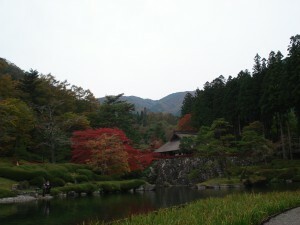 We really enjoyed the autumn leaves at Kohoen which Furumine shrine owned and located nearby. The reason why Kobugahara is famous is that Shoto Shonin who is the father of Nikko trained himself before he concured Mt. Nantai. Since then Monks trained themselves at Kobugahara until Meiji period. Furumine Shrine in Kobugahara has been regarded as a mecca for those who believe in spiritual creatures in mountains more than 1,200 years. Kogashiyama is the highest moutain in Utsunomiya. Only 583m. I was asked my firiend to climb Mt. Nantai with French climber as an Interpreter/Guide a couple months ago. Mt. Nantai is 2,486m high and there is Okunoin-shrine on the summit which I have never ever seen it, therefore I got the job. Unfortuntately I could not accomplish my job due to my health condition. Now you understand why I am talking about 583m mountain. 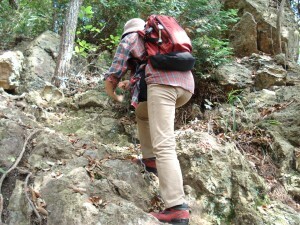 Yes, I started to train myself to climb high mountain with my clients without hesitation. Although only 583m mountain is not so easy for the beginner. I have learned I need more physical training before climb Mt. Nantai next year. We can climb Mt Nantai from May to October. Are you planning to come to Japan? Hi there!! Welcome to my world. I am not realy a typical Japanese person but I am so called international, bit westernized English speaking tour guide. I had been living in New Zealand for 22 years after I had an oppotunity to work at local hotel in Rotorua as a Japanese representative. My carrier is always with the hospitality industry entire my life. I think it is enough to tell you about my history. You may understand who I am. Utsunomiya near Nikko National Park, World Heritage is the city I live. It is about 100km away from Tokyo. It takes less than one hour from Tokyo by shinkansen. Utsunomiya is the capital of Tochigi prefecure and more than a half million people live in this city. Nikko is the third lagest city in Japan and the size of the city occupies a quater of Tochigi prefecuture. It is a quite large city but less than 100,000 people dwelling there. I am going to write mainly about Utsunomiya, Nikko and others in Tochigi prefecture. 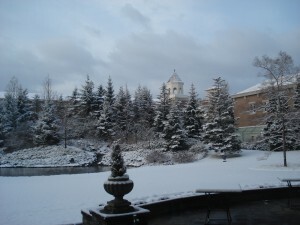 I hope this blog enchorages overseas people to plan to visit our beautiful country and nice people.